Keloids are among the most commonly treated skin ailments at our practice. These spontaneous and unsightly scars are a cosmetic nuisance and, when severe, can even be physically debilitating. It is well known that keloids are difficult to treat due to their high rate of recurrence. However, our patients have the opportunity to avoid this statistic. For appropriate candidates, we offer the CryoShape ™ procedure, an FDA approved treatment that has eliminated keloids without recurrence in over 97% of patients who have had the procedure to date. For appropriate candidates, we offer the CryoShape ™ procedure, an FDA approved treatment that has eliminated keloids without recurrence in over 97% of patients who have had the procedure to date. Keloids are benign overgrowths of scar tissue that occur spontaneously at sites of trauma to the skin. They are most likely to develop on the frontal midline of the body, but also frequently occur on the earlobes. Some keloids are asymptomatic, while others cause varying degrees of itching, tenderness, and redness. Keloids can be hereditary and are most common in individuals of Mediterranean and African descent. Children are also at a higher risk for developing keloids. Treatment is recommended for symptomatic and actively growing keloids to reduce symptoms and prevent enlargement of the keloid itself. Treatment is determined based on the size, location, and symptoms of the keloid. While keloids on the face, chest, abdomen, and back are best treated with a combination of steroid injections and laser treatments, keloids that are larger and more raised or on the earlobes may benefit more from cryotherapy or surgery. Our providers utilize a combination of these treatment methods to give you the best results possible. Excision, or complete surgical removal, runs a high risk of recurrence. Often, keloids that develop after excision are larger than the original keloid. Therefore, excision is typically reserved for keloids on the earlobes or those too large for conservative treatments. 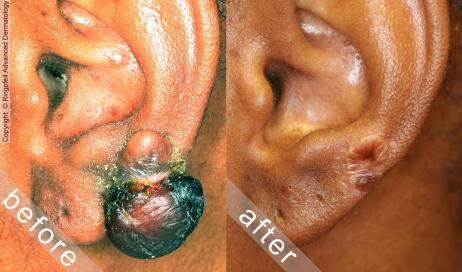 We only perform excision of keloids on the earlobes. Firm keloids must be softened with a series of steroid injections prior to the procedure. 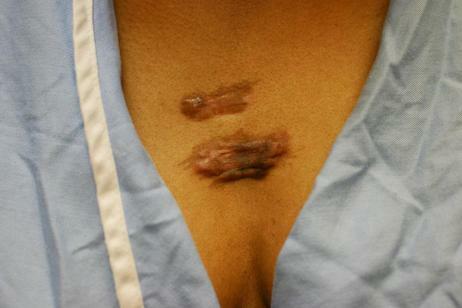 During the excision, the site of the keloid is numbed with local anaesthesia and the keloid is subsequently removed with a shave technique. The procedure is followed by 3 postoperative steroid injections to reduce the risk of recurrence. The first injection is performed immediately after the excision and the following are given every 2 weeks thereafter. Submitted to insurance. Radiation is rarely used in the treatment of keloids, but can be performed after excision of gigantic keloids to prevent recurrence. 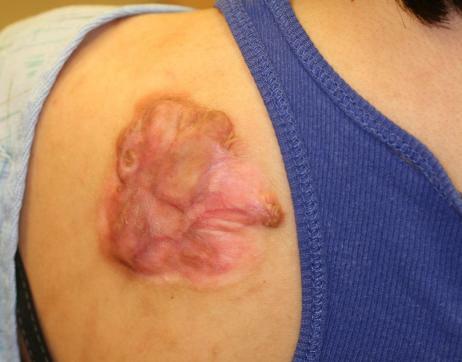 We do not offer radiation or excision of gigantic keloids, but can refer you to a competent specialist. The best way to prevent keloids is to avoid elective procedures, including ear or body piercings, tattoos, laser treatments, or cosmetic surgery. If surgery is medically necessary, steroid injections delivered to the surgical wound after the procedure can be used as a method of keloid prevention. Postoperative application of imiquimod and pressure dressings may also reduce the risk of keloid formation. 10 Comments on "Keloids Treatment"
Good evening Doctor i have a scar on my face right side on my jaw line its been there since 2006 i did two chemical treatments along with 3 injections a while ago. Please let me know if you can help me Im brown skin it looked like a keloid, but then I was informed it could also be a hypertrophic scar as well. The scar is no longer raised above the skin it just looks like a black burn. I can send a picture if possible thanks. Sending a picture as part of an online consultation might work but in my opinion, a scar is best evaluated in person. If dark discoloration is the biggest issue, the picosure laser might be able to reduce the pigment and is safe on your skin as it does not generate heat. Please schedule a scar consultation with me. I really wanna see Dr Ringpfeil but when I made appointment online, her name didn’t appear on the choices of doctors. Is there a chance to see Dr Ringpfeil instead? I wonder if there’s numbing cream applied to keloids before injection? What should I expect if I’m getting kenalog injections? Is it too painful? Steroid or combination injections to reduce itch or pain in keloids and to shrink keloids exert quite a bit of pressure whether by injection or needle free application through dermojet. Pain can be associated with this pressure and when this is the case, we use numbing medicine around the keloid before steroid injection. Topical numbing medicine dose not really reach the nerve endings within a keloid, no matter how long before steroid injection/application it is applied. Please be assured that all associates in the office render the same care to our patients and treatment for keloids. In the interest of maintaining quality of care, I am personally unable to take care of new patients at this time. Hello Dr are you familiar with Electrosurgical Excision of Acne Keloidalis Nuchae with Secondary Intention Healing? I researched this procedure because i need a keloid in my scalp removed with minumum hair loss as much as possible.Do you practice this type of procedure? While I am familiar with electrosurgical amd with CO2 laser assisted excision of acne keloidalis nuchae, i do not perform this treatment. I wonder if it might still be offered at the departments of either Thomas Jefferson University or University of Pennsylviania. I have keloid skin, when I was younger got my ears pierced and a lump appear, then a few years ago had surgery and currently still have small little lumps from the scars. Want to get a tattoo will that be a good idea or will lumps occur? It is indeed not a good idea for you to undergo any elective procedure including tattoo placement because a keloid can form with any type of trauma. Does insurance generally cover Pulse Dye Laser treatments for keloids? Thank you! Insurance usually accepts pulsed dye laser treatment for keloids as proper treatment except when exclusion criteria apply to your plan. Our office submits pulsed dye laser treatment or destruction of keloid depending on the insurance type. Insurance will accept but not pay for treatment if you have a deductible or coinsurance.